As I mentioned last time, our family recently went on a 7-day Western Caribbean cruise. 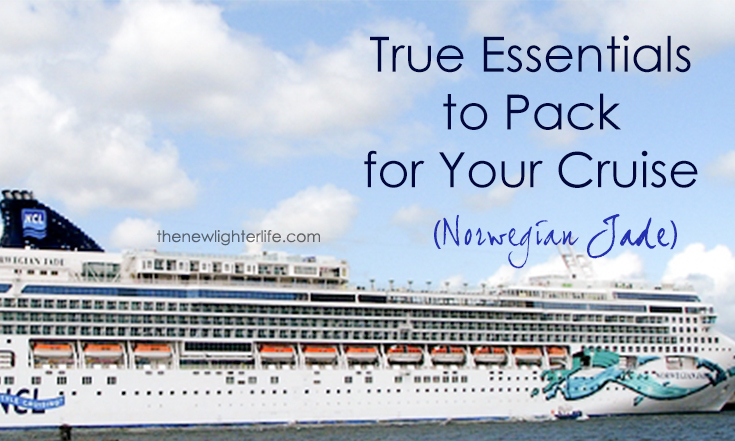 I shared with you what to NOT pack for a cruise. 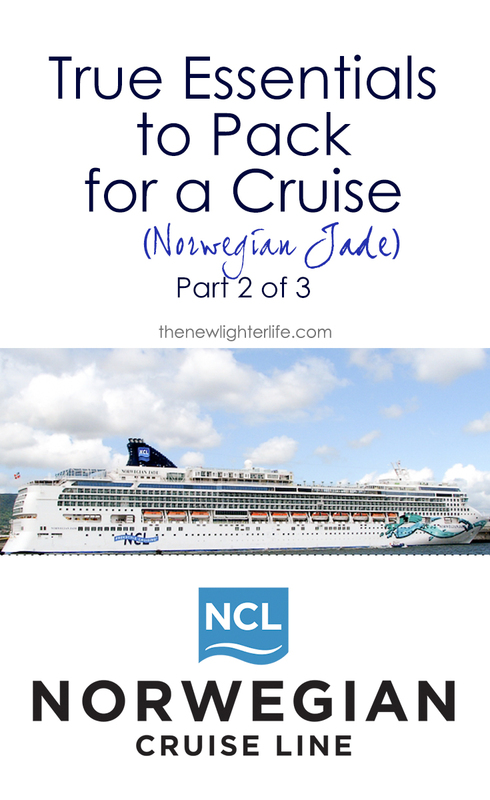 I couldn’t leave it at that so today I’m sharing essentials to pack for a cruise, especially if you’re on the Norwegian Jade. We wondered about baggage limits, just so you know you can bring 2 bags. Each bag is supposed to be 50 lbs or less. With those numbers, you can pack a whole bunch of stuff. But a bunch of stuff just means more to clutter up your room and to have to repack. With that in mind, this is a list of items that packed a big punch as far as usefulness. A few of the items were not obvious to us, but we’re so grateful we did packed them, (or were able to buy them on board). Lanyards – Wow! This is at the very top of my list! Lanyards are super-useful for keeping everyone’s key cards close by and accounted for. You use your key card multiple times throughout the day and it needs to be handy, (and NOT lost). Drinks, checking your children into the kid’s club, specialty dining, stateroom access, hopping on and off the ship at port…you get it. Mark was a rebel and a few times he stuck the kids cards in his pocket. So I ended up walking all over the cruise ship to round up cards for drop off in the Splash Academy, (kid’s program). It is so much more convenient when they just wear them all the time, (except at port). You can buy lanyards and the plastic holders in the office section at WalMart. If you need more than 6 of them, you’re better off buying them in bulk from Amazon . Highlighter – Surprisingly, highlighters are a close second as far as importance on my list. I mean really, who would have thought a highlighter?!? A couple other cruise sites/blogs recommended the highlighter and I didn’t think I’d use it. Let’s face it, highlighters don’t take up much space. So we brought a highlighter and I’m so glad we did! Every day we were brought a new schedule of activities and events, (the schedule is loaded with diversions to keep you busy so it is easy to miss something you want to do). Our trusty highlighter was used excessively and I’m so thankful I had it. Light Sweater or Jacket – It was unexpectedly chilly on our cruise, (especially at night) so we needed to layer up on with our summer clothes. I ended up buying a sweatshirt in the gift shop, doh! Warmer Clothing – I know I said it earlier but it was chillier in the cruise than we expected, especially as we got closer to the U.S. We packed 1 pair of jeans but would have worn them 3 days of our trip. If you’re cruising during the winter months pack some clothes that will help you be comfortable. Bottled Water – We drink a ton of water! There are some rumors going around that the filtration system on board is not very good and the water has a bad taste. I wouldn’t call us water connoisseurs but we honestly had no problem with the taste of the water. We still needed water while we were in our stateroom and that’s where our bottled water came in handy. You’re allowed to carry on your bottled water, so I say go for it. You are technically required to physically carry your sealed bottled water, (through security) rather than pack it in your luggage. We didn’t know this for certain so we pleaded ignorance and stuffed it into a large duffel bag. We had a very cool Porter in Houston that essentially turned a blind eye and told us he’d say he never saw it. Our water ended up making it to our room but definitely carry it on your person to be safe. Ziploc Bags – I found the 2 1/2 gallon-size Ziplocs help store dirty laundry. The 1 gallon-size kept their undergarments together. We used the smaller sizes for shells we found along the beach and for liquid toiletries. Extra Empty Duffel Bag – If you plan to buy souvenirs on your trip, you need a plan to fit everything by the end of the trip. It’s always harder to fit dirty clothes in your luggage at the end of a trip, so we brought along an empty duffel bag. We also used the duffel bag we smuggled our bottled water in on. Win-win. Small $ Bills – You want smaller bills for tipping and purchases made at the ports. On board, the only place that accepts cash is the casino. All other purchases are billed to your credit card on file. Everywhere we went, (Cozumel, Belize, & Roatan) U.S. dollars were accepted but they couldn’t ever make change. Really this was a duh moment for us. We knew better and spent far too much money off ship because of it. More often than not, we ended up using a credit card. On the trip, we brought mostly $50’s & $20’s but thankfully we were able to use the casino’s change machine to break some of our bills up into smaller denominations. A word on tipping. At the end of the cruise, you pay a gratuity for your entire stay. This is a daily rate and it is fixed. Still we found that there were times when the service we received was exceptional so we wanted to tip more, (this was mostly in the specialty restaurants). We left larger tips for our Concierge, Butler, & Steward (housekeeper) – I’ll get into that in an upcoming post with our tips for cruising with Norwegian. Earplugs – In our stateroom, the cabinets and drawers creaked and squeaked as the ship shifted and moved. The first 2 nights we hardly slept at all. Our Steward was so helpful, he tried to get our room to stop creaking but it’s impossible with a moving vessel. Ear plugs went in. Sea Bands or Motion Sickness Patches – (cheapest I found were on Amazon). Sea Bands were a lifesaver and we didn’t have to be drugged up on Dramamine. Ellie and I are especially prone to motion sickness and thankfully no one got sick. After the 3rd day at see, we took them off and felt great. A lot of the passengers used the motion sickness patches, (the children had the patch cut in half and it was placed behind their ear). On a side note, we got to witness 2 kiddos throw up from sea sickness. Oh, the joys! LOL! So that’s it! Essential to pack on a cruise. Poly Folder – Throughout the cruise, they give you GOBS of paperwork. I wish we would have kept the daily schedules and information, (at least until after the cruise). A simple poly folder would fit the bill. Essential Oils – Our little guy got a cold on the trip and I wish I would have had our immune support and eucalyptus oil. A travel essentials oil kit would be ideal like this one over at Mother’s Niche. Experienced cruiser….do you try to be a minimalist in your packing or do you prefer to bring the kitchen sink too?